Motley Fool Australia » Investing » Is this Google’s next Nexus combo? Is this Google’s next Nexus combo? Google‘s (Nasdaq: GOOG) Nexus devices are widely considered as good as it gets in the Android camp. The devices are an Android purist’s dream, as they typically lack excessive software modifications imposed by wireless carriers or third-party OEMs. Perhaps more important, Nexus devices are typically the first to receive important software updates that bring the newest features and security patches. That helps address the platform’s fragmentation, widely considered Android’s greatest flaw. Even now, 56% of devices are still using Android 2.3 Gingerbread, originally released nearly two years ago — an eternity in the rapidly evolving mobile sector. 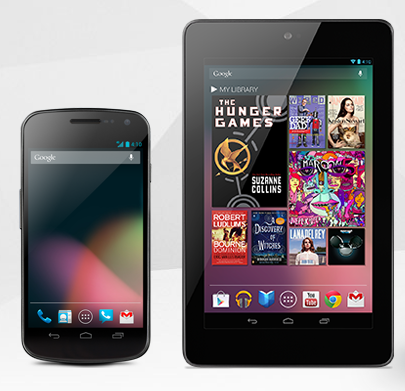 Google currently offers a Nexus-branded smartphone and tablet, the Samsung-built Galaxy Nexus and Asus-built Nexus 7. The Galaxy Nexus was launched in December of last year, while the Nexus 7 made its debut this summer. Here’s the happy family now. That means it’s about time for a new Nexus smartphone, but the search giant reportedly has more in its multi-coloured pipeline. CNET reports that LG is lined up to make the next Nexus smartphone for Big G, one that will closely resemble its own new flagship Optimus G. The device is said to sport one of Qualcomm‘s (Nasdaq: QCOM) newest quad-core Snapdragon processors, and the Optimus G also carries one of Qualcomm’s newest baseband chips as well. LG has long been a smaller player in the world of Android hardware, while rivals like HTC and Samsung flew past it to capture consumer attention over the past couple years. Both of those companies have built Nexus devices for Google in the past. An official Nexus seal of approval would be a boon for LG. Even more interesting is talk that Google could have multiple Nexus phones in the wings waiting to be deployed, which coincides with a Wall Street Journal report earlier in the year that Google was working to create an entire portfolio of devices. The Nexus 7 is just three months young, and Amazon.com (Nasdaq: AMZN) is putting the heat on with its new Kindle Fire HD while Apple (Nasdaq: AAPL) is all but ready to launch an iPad Mini this month to take on the 7-inch crowd. Amazon is boldly moving up-market with its 8.9-inch Kindle Fire HD to challenge the full-size iPad. CNET is separately reporting that Google also has a similar move in store. NPD DisplaySearch analyst Richard Shim says that the search giant is partnering with Samsung for a Nexus-branded 10.1-inch tablet with a display meant to rival the new iPad’s Retina display. The rumoured device supposedly features a display resolution of 2,560 x 1,600 at a density of 299 pixels per inch, higher than the new iPad’s 264 pixels per inch. That could put Google in the running this holiday season in the full-sized tablet market, competing with Microsoft (Nasdaq: MSFT) Windows 8 tablets, the 8.9-inch Kindle Fire HD, and iPad. Windows 8 launches at the end of the month alongside Windows Phone 8, and the software giant (along with many of its hardware partners) is pinning its tablet dreams on the operating system. Investors still haven’t seen Motorola build a Nexus device — rather curious considering the search giant swallowed the OEM whole. Google also recently said that costs related to restructuring the subsidiary would be slightly higher than previously expected, totaling roughly US$300 million. Motorola is also facing layoffs as Google looks to make the division profitable, which it wasn’t when left to its own devices. It still seems an eventuality that Google will one day launch an integrated device with Motorola, since that’s the direction where the market seems to be moving. Either way, Google is definitely making a large coordinated push and raising the bar for Android devices through expanding its Nexus program. This next Nexus combo will pack a punch.